Session 2 runs from February 4th - May 10th. Drop-In Playgroups require no registration. Playgroups are a place to meet other parents and caregivers with infants, toddlers and preschool children in a language-rich environment. Each week, participants experience literacy support through play, conversation, singing and sharing books. Playgroups are open to all Somerville families with children birth to 5 years. Families may register for one playgroup per week plus attend Drop-In Groups. Two sessions per year are offered in English, Spanish, Portuguese and Nepalese. 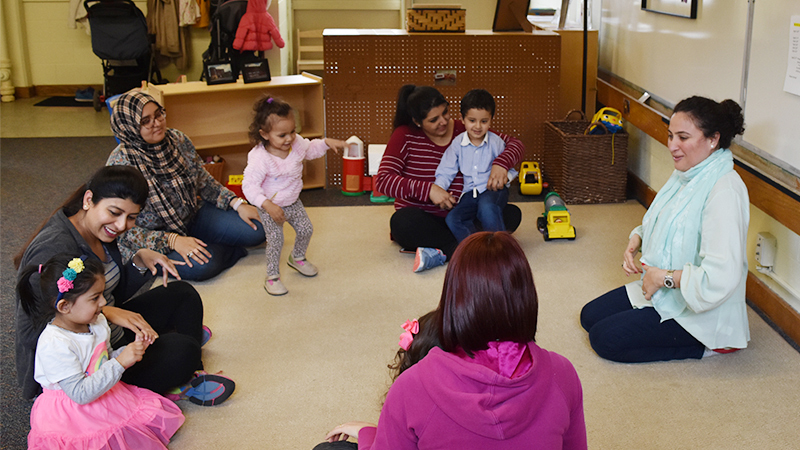 Discover & Learn Playgroups offer distinct areas of the room engaging babies to 5 year olds. There are a variety of experiences that support the development of children's literacy, math, science, music, art and social-emotional skills! Language-Specific Groups offer families all the components of a Discover & Learn playgroup run in their native language! Climb & Create Drop-In Playgroups provide many opportunities for children 2 to 5 years old to develop their large motor skills while still offering opportunities for discovery and creativity! PCHP Playgroups are for Somerville families enrolled in the Parent Child Home Program. It is an opportunity to meet other families in the program while learning through play! Wondering Together 1 Support Group includes playtime for children 1 year old and adults together, plus a facilitated adult discussion time to explore toddlers' learning and development.Toddlers play in a supervised learning environment and practice separating from their caregviers. Adult group time is held in the same room. Conversation topics will be generated both by particpants and facilitators. Wondering Together 2 Support Group includes playtime for children 2 years old and adults together, plus a facilitated adult discussion time to explore toddlers' learning and development.Toddlers play in a supervised learning environment and practice separating from their caregviers. Adult group time is held in the same room. Conversation topics will be generated both by particpants and facilitators. New Parents Drop-In Support Group (Prenatal - 12 months) Fridays, 1:00 - 2:30 p.m (Yellow Door). The Somerville New Parents Group is open to all expecting parents and parents with babies from birth - 12 months old. It is a drop-in support group where families can make connections with each other, find resources and share ideas and supports. Sharing our Stories Drop-In Support Group for families with young children with special needs. (Purple Door) Raising a child who does not always fit in can be challenging. This free, open-ended group will offer adults the opportunity to share joys, concerns, frustrations, questions and resources about their experiences. Conversation in English, interpretation upon request. SomerBaby is a FREE and voluntary community program to welcome new babies to Somerville!. Each SomerBaby family receives a home visit, support, resources & a Welcome Baby Bag filled with information, a book and blanket for baby and much much more! For more information or to make an appointment for a visit email Flor Apolaya or call her at 617-625-6600 x6702.